"One of the first golf clubs west of the Mississippi"—established in 1894, the Tacoma Golf Club began with a lease on a small section of prairie land in Edison (now known as South Tacoma). 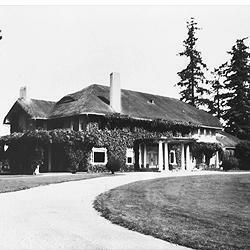 The Club moved and expanded to 287 acres at its present location on the shores of American Lake in 1904 with the purchase of the R. B. Lehman property owned by the Tacoma Land and Improvement Company, all for only $7000. In 1905, the Tacoma Railway & Power Company constructed tracks to the Club. Electrical power arrived in 1907 to operate the water system and lighting was provided from gas supplied by the Pitner Lighting Company. In 1909 the club house was totally destroyed by fire. A new club house, the "Grand Old Lady", was built in 1910, only to have it also destroyed by fire 50 years later in 1961. The current club house was built and opened in December, 1964. Upgrades were made in 2008 to add the "1894" café and bar. Today, the Tacoma Country & Golf Club is recognized as one of the finest in the Pacific Northwest. 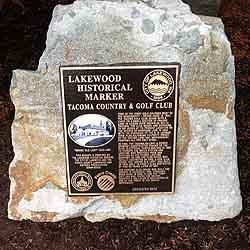 This marker is provided by the Lakewood Historical Society, the City of Lakewood, and the Pierce County Landmarks Preservation Commission.